To those Afrikan (black) people who support Afrikan (black) people in their efforts of being self-sufficient (owning and controlling our own destiny). As you read this letter, let it be known that although many shades of ‘blackness’ we are still an Afrikan! I am appealing to all “conscious” Afrikans support for “the Ghana Nkwanta Project”. It is imperative that we as “Captive Afrikan Survivor Refugees” (C.A.S.R.) work together at this crucial time in the history of Afrikan people, wherever we are on the planet. We can collectively fulfill the aspirations and goal of Pan-Afrikanism!!! This is a momentous moment in our history as we move forward to develop Universal Pan-Afrikan Community/ties!!! So that we can leave a Legacy of Land and Self-Sufficiency coupled with total control of our raw resources….in Afrika for our Children to inherit. We have been given “LAND” of over four square miles totaling eight to ten thousand acres of “Land” by Nana Awuku Nsana II and the people of the “Dadaise Adele Traditional Area” in the North Volta Region of Ghana (April 2004). 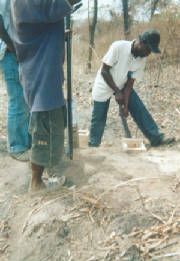 March 2007, the initial surveying of the “Land” began with half of the survey fee paid to the Surveyor and team ($10,000.00). The balance of the surveyor’s fee ($10,000.00) is needed upon completion of the survey. The lawyer’s legal fees are needed to finalize all the necessary documents and paperwork to make the “Land Gift” ours legally – ($5,000.00 - $3,000.00 to lawyer to commence his legal work and the balance of $2,000 upon completion). Upon completion the “Ghana Nkwanta Project” can do a massive outreach campaign to ALL C.A.S.R. to become involved in the development of this “Land Gift”. Our initial goals are for the ‘land’ development of ; Houses, Hospitals, Farms, Factories, Education Institutions…Post Office, Banks, Recreational Facilities, Library/Research Center. Along with the need for Donors, we need Investors for additional structures e.g., Motels, Retirement Centers for the elderly and whatever is needed to be totally self-sufficient. The people in the village are waiting for the C.A.S.R. to hurry up and begin the developing process. The social and cultural bonds between us are already there; the commitment from you the C.A.S.R. is lacking to implement the goals especially the “Conscious” community of Afrikan people globally who have the Destiny of the Afrikan Race and its “CHILDREN” first”!! Our dearly Beloved Elder Queen Mother Adunni Oshupa Tabasi/NuNu Afua Frifie II, (enstolled, April 2004, Ghana) has labored out of Love for Afrikan people (no matter where they were born) for more than fifty-years at NO PAY, following in the footsteps of all Afrikan Warriors in the “War” against “Enslaved Captive Afrikans” to the present. The Ghana Nkwanta Project Members are making a serious APPEAL to all Afrikans still held in Captivity, whether you want to believe it or not – we are at the crossroads of Total Extermination; just look at the activities being committed on Afrikans!! Donations and Investors are urgently needed on a continuum. We immediately need skilled Afrikan Persons” to help to develop the land’s Development Landscape, and the development of the community; including the village community. Thereby implementing a Pan-Afrikan reality! A concrete reality fully manifested for all to see as a model to be duplicated throughout the Afrikan Continent. Your input into this project is vitally needed!!! “Deferred Dreams”, “Promises”, “Pies in the Sky” mentality is no longer acceptable and tolerated. This mindset was never envisioned for those who opted to be in control of themselves. There is over a five-hundred year track record of “Resistance” by “Captive Afrikan Survivor Refugees”. Don’t ever lose sight of nor forget “KATRINA 2005”! “Captive Afrikan Survivor Refugees” who are of many Hues within the Afrikan Race universally (many often in-denial of identity) “Conscious” and “Un-conscious” spend billions if not more yearly on materialism, bling-bling, cars, clothes, furniture…) in addition to countless, fruitless meetings, staying in non-Afrikan owned facilities for political rhetoric and eating at expensive restaurants. Very little, if any of this money goes to support Afrikan owned businesses as in the “Segregated Era”. Alleged “Integration” brought about C.A.S.R. downfall (regress), not progress. No longer do we as a people in general support our own businesses and systems as we had under segregation!!! These “ineffective” political events do not contribute to our upliftment as a people. This is the Dilemma and Predicament we find ourselves in today, 2007. Unfortunately, many enslaved Afrikan People in the 1950s and the early 1960s got sidetracked, bamboozled by the ‘Power Brokers” hype and “Zest” for inclusion into a “Burning House” !!! Where is our sense of action? How do we break the Rhetorical Cycle of spiraling downward rapidly? We can by building Afrikan Communities on TRUST, LOVE and BELIEF in OURSELVES. Only then can we C.A.S.R. create concrete change, two, “Physician Heal thyself!!! Let the “therapeutic treatment begin”!!! Recently the “Ghana Nkwanta Project” members lost one of their most dedicated and committed Afrikan Warriors. Mother Franklin was a stalwart champion in the interest of Afrikan People and the Pan-Afrikan Ideology. Her “Dream” to see the “land gift” and the development was not fulfilled. The GNP members’ goal is to move the project forward to realize the goal of Elder Mother Melva Rita Franklin. She should be an incentive for the young generation of the C.A.S.R. to emulate. Mother Franklin at ninety-five was still in the struggle for absolute FREEDOM and self sufficiency and for total control of the Afrikan Continent by all Afrikans on the planet. In closing FREEDOM WAS NEVER FREE!!! It has and continues to be a COSTLY PRICE PAID that brought C.A.S.R. this far. We as a people are always at the starting line without ever getting to the finish line, why? DISPERSION AFRIKANS, in the United States in particular are still “Landless”, “Homeless”, and no representation at the United Nations, think about it!!! The NAYSAYERS among us, who are always saying this or that won’t work. Yet the strategy of exploitation is being worked on all C.A.S.R., including Afrika and implemented by Non-Africans. The Ghana Nkwanta Project Members want to see the skilled C.A.S.R. who have and continue to labor in the BOWELS of the United States (and elsewhere) all their lives to see the reality of Pan-Afrikanism as a concrete reality in the development of the Nkwanta Community in Ghana!!! Once again GNP members are Appealing to All Afrikans Globally to join in this project as a beginning in the development of the Afrikan Continent for generations of Afrikans “yet unborn”. The GNP needsall Afrikans who are “conscious” to give monetary support NOW!! Donors and Investors, our continued existence as an Afrikan People depend on your commitment since YESTERDAY!!! Donors; $10.00, $25.00, $50.00 and $100.00 dollars per year. For those who can contribute more do so, time is of the Essence!!! Investors, $1,000.00, $2,000.00, $5,000.00 to one-million or more to develop institutions, etcetera, in your names for Posterity. Together we will work to build and develop the “LAND GIFT’ that was given for the betterment of all Afrikans. This LAND GIFT will be the INHERITANCE for all yet unborn Afrikan children to inherit. No longer will any Afrikan ever again in or outside of Afrika ever be LANDLESS AND HOMELESS ever again!! !